For those still gnashing their teeth in frustration over not having more Magpie Lord to dive into, behold! You have here a sequel/extension of Charles’ popular paranormal historical romance series, this time following the side character of Jonah, who had played an important and villain-ish role in Flight of Magpies (#3 in the Charm of Magpies series). Unlike some of the horrible baddies in that volume, he wasn’t completely and utterly irredeemable. He did have a heart, or at least, he had someone he very much wanted to protect and was willing to do whatever it takes to keep that person safe. Jackdaw follows sometime after book 3, when disgraced former policeman Ben comes to London to track down the bane of his existence (and former love of his life), but he’s not the only one looking for Jonah Pastern, and he comes face-to-face with five feet of menacing power, Stephan Day, who more than anything wants to drag Jonah kicking and screaming to justice. 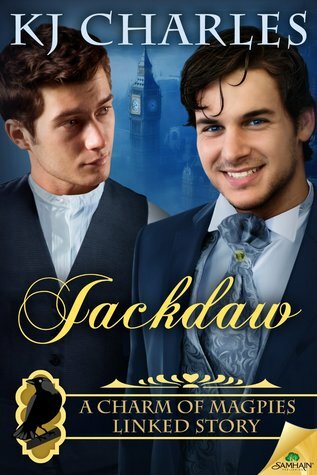 Jackdaw is different from the other books in the series in a couple ways—first the obvious one is the story follows Jonah and Ben’s journey as once lovers, now wracked by bitterness and regret, but still can’t give up on each other, and when the Victorian version of the Heat come crashing down on them, they flee London together. Along the way, truths are revealed, apologies spoken, and promises made, and the two of them see if they can get beyond their pasts to see if a future is possible. Besides the starring characters, the other big difference is the thrust of the story. The Charm of Magpies series normally had a big Baddie or three and some kind of case to push the story forward and torment Stephen and Lucien. In Jackdaw, technically Stephen IS the big baddie, but the focus of the volume is really on Jonah and Ben reuniting and tentatively repairing what was broken, and those repairs play out over the windswept coasts of Cornwall as they adjust their lives to living in a small village. For me, who is a big fan of Charles’ work (with The Magpie Lord being my fave read of 2013 and Think of England being my #1 in 2014), Jackdaw was a fun time revisiting the Magpie world, but I did feel less connected to it than the other books in the series. Since the focus is more on Jonah and Ben’s wary reconciliation, I found the pace much slower than the other books. That, and Ben is a somewhat morose and grim character. (He has every right to be with his recent history, thanks to Jonah.) But this means their relationship felt much more somber, a soft, tentative glow, as opposed to the zinging sparks that you could feel between say, Stephen and Lucien (or if you jumped books, Archie and Daniel in Think of England.) As happy as I was that Jonah and Ben were reforming the fierce bonds between them, I did miss that energy, and found the book easier to set aside compared to the others. With that said, I think if you have enjoyed the Magpie series, then I think you will enjoy diving into this one as well, both to revisit with such beloved characters, envelop again into Charles’ marvelous writing, and follow two lost souls who, when given the chance, will fight tooth and nail for the one the love. Can you read this one without reading the others? Maybe? I wouldn’t recommend it though since Charles saves time by providing only minimal world-building in this one, and you may feel less connected with the drive-by references to earlier characters or plots from the other books. I think those that have read the other books are primed to enjoy this volume the most. If you’re a diehard fan like me, you’ve probably already pre-ordered this one, but for those wondering, my rec is—If you liked the others, then it’s a safe bet that you will enjoy this one. This entry was posted on February 17, 2015 by TracyTG in Historical, PNR / UF / SF / DYS, Reviewer: Tracy and tagged 4 Stars, kj charles, samhain publishing.